Ask God to grace you with a "newborn" believer, whom you can walk with, spiritually nurture help grow up to fullness in Him. Happy Easter my dear friends. It truly is the MOST wonderful time of the year! By grace through faith in Jesus Christ, we are spiritually reborn bringing us from death to life. What we celebrate this Sunday is what made it all possible. I pray that the gospel is more alive to you this Easter than ever before. God has been on the move here in the past few months! I cannot wait to tell you the whole story. He has readied many hearts to respond to him for the first time. I find myself with the great privlege of walking alongside many newborn follows of Jesus. He's also been doing such a reviving work in His people and waking up to His glory. Bibles are coming off the shelf and knees are hitting the floor. I so wish we could sit down over a cup of coffee and encourage one another with what He's been up to. Know that you are a regular part of my prayer life. I'm continually asking Him to strengthen you with power in your inner being so the Messiah may dwell in your hearts through faith, that you may be rooted and established in His great love and together we may be able to comprehend the length, width, height and depth of His love and to know this love that surpasses understanding. That He would fix your eyes on Jesus, that your hearts desire would be to love Him most, love others like He loves you, and make disciples. That He would convict you of sin that is robbing you of life to the full, give you a willingness to repent and instead be filled with the Spirit. A dynamic and powerful reading of the Easter story straight from scripture can be found HERE. Nothing compare to the living and active Word right from the mouth of God. This season, Beth felt lead to simply speak scripture. I know these eternal Words of life will take root in your heart and bear much fruit. I enjoyed this post by Kelly Minter with a timely reminder to not letting obstacles keep us from journeying toward Jesus because He is able to take care of the impossible. You'll be reminded to pursue it in the person of Christ rather than looking for life in empty places. You'll be reminded that you're a uniquely gifted disciple of Jesus who can go share the good news of the resurrection. And speaking of going and sharing the good news... what better way to respond to Easter than living with the mission of God? We are invited to continue His mission that He made possible on resurrection Sunday. 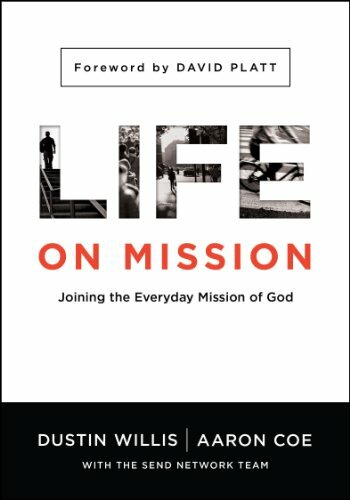 This book, Life on Mission, will give you the practical tools you need to join Jesus on His mission- to reconcile men to Himself. The practical steps to identify, invest, invite and increase will take the mystery out of living a life on mission with Jesus and give you tangible next steps. I dare you to ask Him to show you where He's at work around you. Actually, make that a double dare because I'm asking Him to. From the first time I asked Him in 2002 (after learning of the truth that He's always at work around me in Experiencing God) until more recently a few weeks ago, He's had an answer every single time. There's always someone He is drawing to Himself. Lastly, I recently added these Resurrection Eggs to our Easter story collection. If you have littles, they'll love the hands-on telling of the story. My littles and I are excited to host friends for an Easter party and use them to tell the story of the first Easter. They're easy to make and are a great story telling tool for little ones. That's all friends. Sunday is coming.... Emptiness has never been such good news!